We are continuing with our work to replace 7,000 aging rail pads and 5,000 linear metres of running rail on the Expo Line. This phase of the Running Rail Replacement Project began this February and will continue through summer 2017. This batch of work will include single tracking later in some evenings as well as some morning and afternoon work on the weekend. On May 27 and May 28, two sections of track west of Main Street–Science World Station will require extended times to accommodate the necessary special treatment to pre-bend the 60 foot rail sections before installation. Please take note of the schedules below and know before you go! From 11:30 pm until the end of service. From start of service until 3:00 pm. There will be no single tracking Sunday evening. From 9:30 pm until the end of service. Expo Line trains will use one track in both directions at Main Street–Science World and Commercial–Broadway stations. Expo Line passengers should allow for 15-20 minutes extra travel time. All Expo Line trains will operate between Waterfront and King George stations. Expo service to Sapperton, Braid, Lougheed Town Centre and Production Way–University will be replaced with trains operating between New Westminster and VCC–Clark. 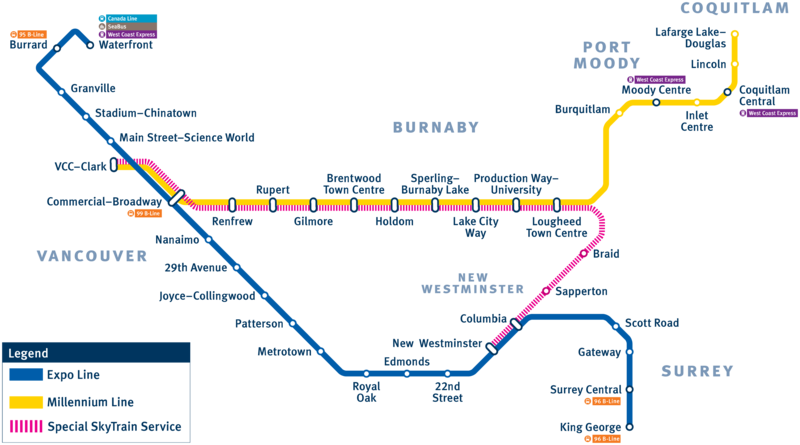 Passengers from other stations on the Expo Line can change trains to this service at Commercial–Broadway, New Westminster and Columbia stations. This work schedule is subject to change. Learn more about our Running Rail Replacement Project! Have questions about this project or single tracking? Ask away! Tweet @TransLink or call 604-953-3333.